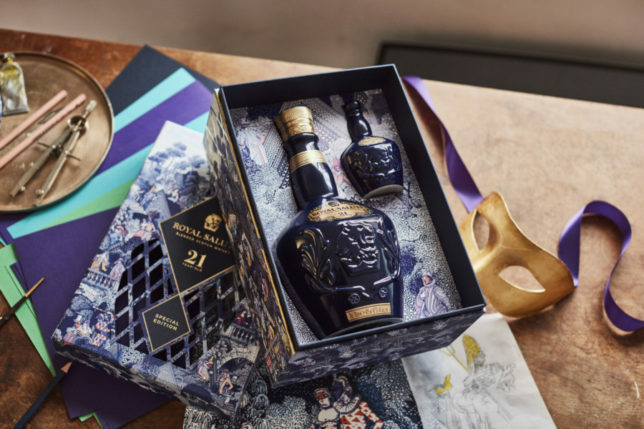 The ‘King of Whisky’, Royal Salute, invites you to ‘unwrap’ the ultimate gift this festive season as it announces the latest in a series of annual festive gift packs, this time inspired by the famed royal Masquerade Balls held at the Ranelagh Pleasure Gardens in London. 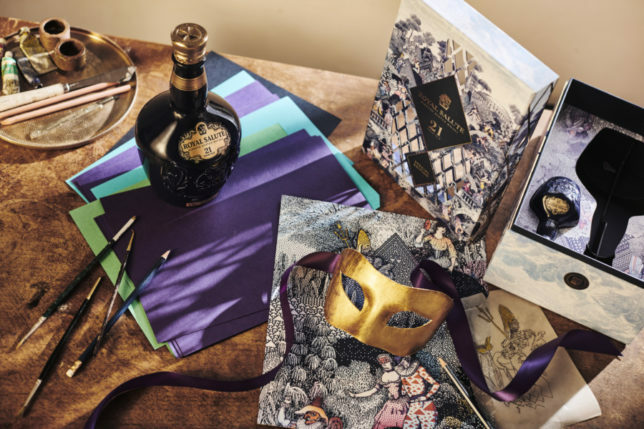 Available globally from October, the exquisite new limited edition has been created in partnership with esteemed British illustrator Phil Wheeler who has depicted the Masquerade Balls in stunning colour and detail. The toast of high society in the 18th Century, these events were evenings like no other and attended by royal guests, dukes and wealthy merchants, who would revel under the mysterious guise of anonymity – their masks. Phil, who is renowned for his colourful and exuberant work, has used his signature style to bring these spectacular scenes to life in an elegant design with shades of blue, pink and purple alongside Royal Salute’s signature gold touch. 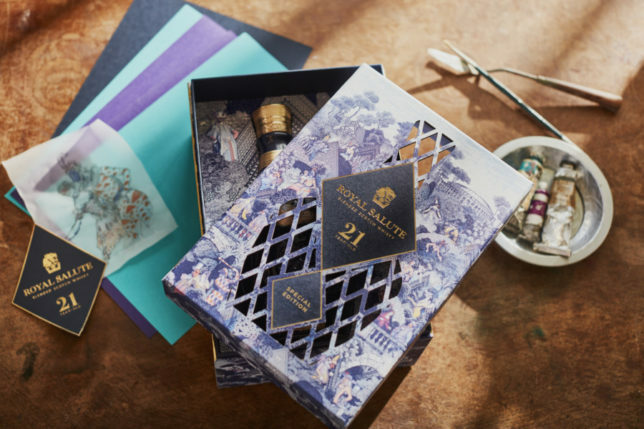 The limited edition features an intricate laser cut lid and a collector’s edition gift box that houses the jewel in Royal Salute’s crown: its signature 21 Year Old whisky, in all its rich, round and robust glory, alongside a miniature version for collectors. 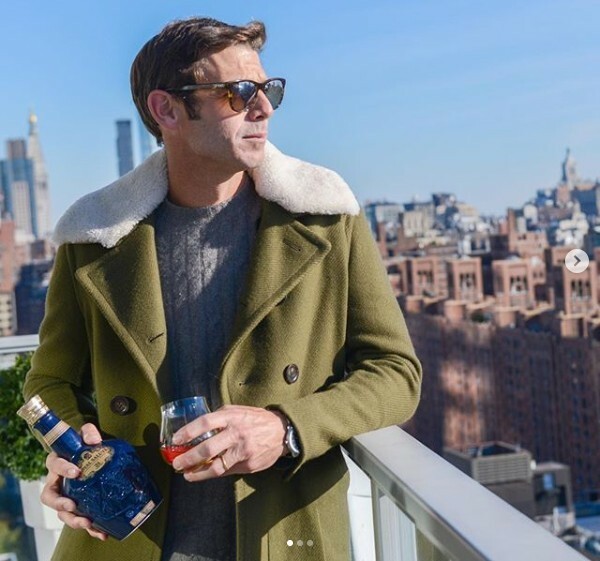 Created by Royal Salute Master Blender, Sandy Hyslop, the expression is exceptionally crafted and aged for a minimum of 21 years, resulting in a standout whisky fit for royalty. Royal Salute has lovely deep golden amber colour and is rich, fruity and has sweet fragrance of autumn flowers on the nose. 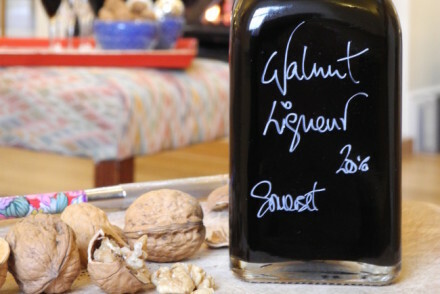 The powerful aromas of sweet pears and citrus fruits are balanced with the elegant aromas of sweet vanilla with a dry oakiness leading to subtle notes of sherry and smoke. 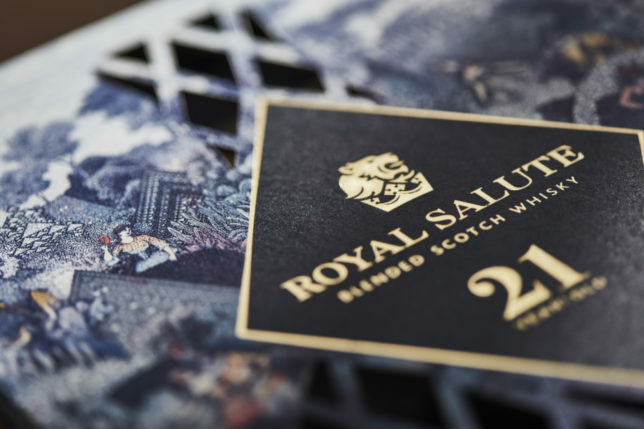 Royal Salute was first created as a gift for the Coronation of the Queen in 1953 and gifting has remained at its heart ever since, with this latest gift pack a fitting tribute to the British monarchy’s royal celebrations and part of the ‘Royal Celebrations at the Palace’ annual series. 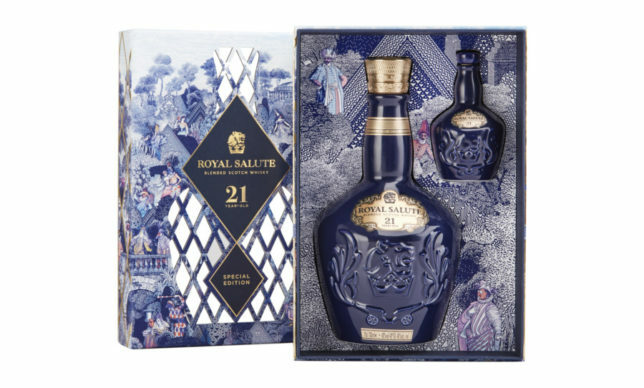 The Royal Salute 21 Year Old Masquerade Ball Festive Gift Pack is available now at London’s iconic department store Selfridges for £160 just in time for the festive season and comes with the 70cl bottle and a handy 5cl miniature bottle to allow you to sample this exceptional whisky without affecting your prized collection. 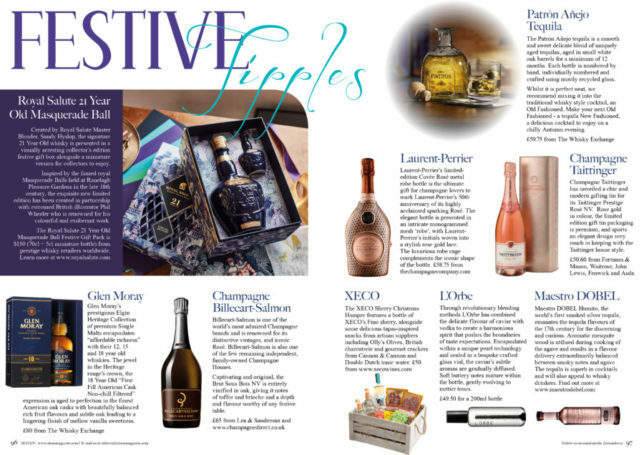 For more festive tipple ideas including Royal Salute, check out the Christmas Edition of SLOAN! 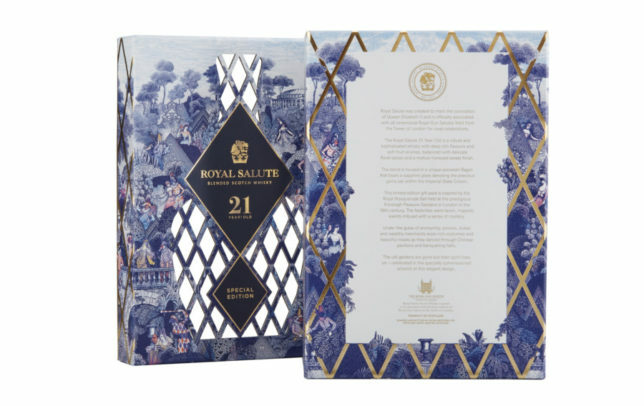 For our overseas readers, you can find Royal Salute 21 Year Old Masquerade Ball Festive Gift Pack at luxury whisky retailers around the world available with a recommended retial price of for USD $130. 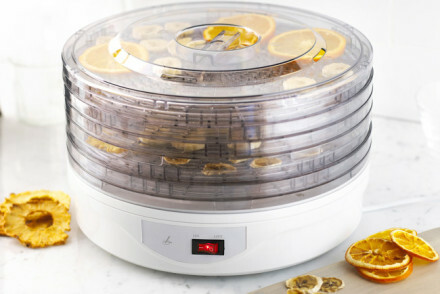 For further information, please visit www.royalsalute.com.